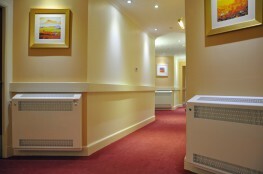 Contour Heating Products Ltd > News > How Are LST Radiator Covers For Schools Installed? How Are LST Radiator Covers For Schools Installed? Safety in schools is pivotal to the health and wellbeing of staff and students. Contour recognises this; we complete LST radiator cover installation processes in line with procedures that maximise safety and minimise disruption. Here’s how Contour could fit your educational environments with LST radiator covers so that you remain in line with heating regulations and eliminate the risk of injury. After your initial enquiry, Contour will carry out an onsite survey, free of charge. During the survey, Contour representatives will note any specific features that will require modifications to your LST radiator covers. Modifications will be made during the manufacture of your LST radiator casings to avoid any extensive disruption when your radiator guards are installed onsite. Within 48 hours of your survey, Contour will contact you with a quotation for your LST radiator project. You won’t be committed to a project until you have accepted a proposed quotation. Contour allow 10-12 working days for the manufacture of your LST radiator guards. We will contact you when they are ready for installation in your school. Contour aim for LST radiator cover installation processes to be as efficient as possible. Schools are busy environments where safety needs to be maximised, which is why Contour make any required modifications to your LST radiator casings during the manufacturing stage of the procedure. This way, your installation will be quick and easy. Contour install LST radiator covers by fixing them into 3 sections of the frames so that they are permanently fixed into place for security. However, the radiator guard doors will still be easily removable for thorough cleaning and maintenance. Installation times vary depending on a variety of factors, including sealant type, removal of previous radiators and the size of your order. Contour will happily complete your LST radiator cover installation outside of working hours to avoid any disruption to children’s learning. We’ll accommodate your school’s needs. Contour also offer full removal services for your old radiators. We’ll responsibly recycle these for you. Following the installation of your LST radiator covers, Contour will apply a silicone sealant or anti-pick mastic, popular in SEN schools, to seal your radiators and casings to your classroom walls. All of Contour’s instalment teams are CSCS and DBS checked. At Contour, we pride ourselves on providing the highest-quality LST radiators and radiator casings. Our premium heating product range ensures safety in schools throughout the UK. For extra security, your LST radiators and radiator covers will be protected by 10 and 5-year warranties respectively.